A postman has been arrested in Italy after 570kg (1,100lb) of undelivered post was found in his garage. Police were called to the address in the northern city of Vicenza and arrested the 56-year-old man. Workers from a recycling plant found more than 40 plastic containers stuffed with letters, bills and bank statements dating back to 2010. 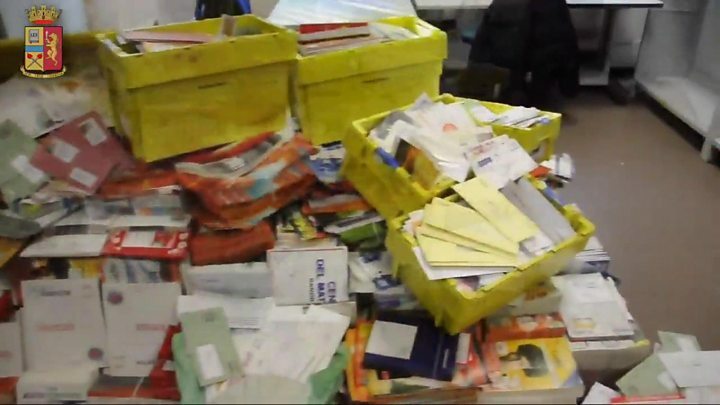 It is the largest-ever collection of undelivered mail found in Italy, Italian police say. The postal service in Vicenza say they will deliver the pile of mail to its intended recipients, despite many items being several years late. The Italian postal service says it has suspended the employee, Italian broadcaster RAI reports. It will push for legal action against the postman and start an internal investigation to find out what happened, RAI adds.